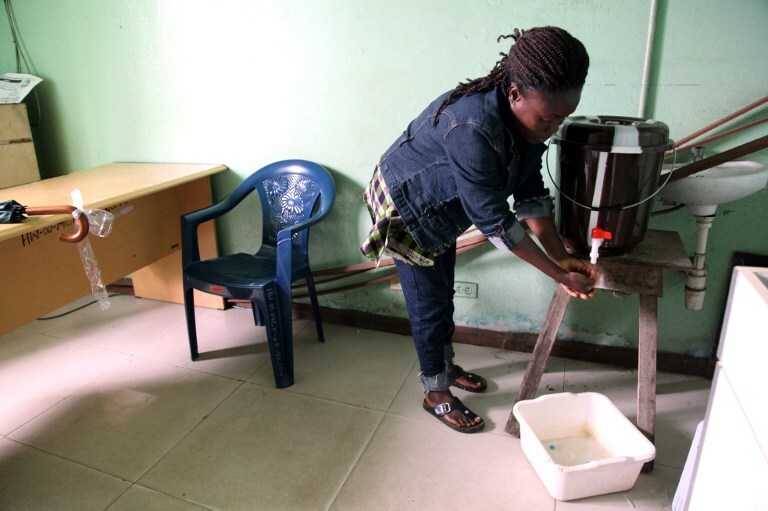 A woman washes her hands with chlorine water in prevention from contracting Ebola at a public health centre on July 31, 2014 in Monrovia. CONAKRY - The World Health Organisation warned west Africa&39;s Ebola-hit nations on Friday that the epidemic was spiralling out of control and could spread to other countries, causing "catastrophic" loss of life and severe economic disruption. WHO chief Margaret Chan told the leaders of Guinea, Sierra Leone and Liberia at a regional summit the response to the epidemic had been "woefully inadequate", revealing that the outbreak was "moving faster than our efforts to control it". The leaders were in Guinean capital Conakry to organise the deployment of hundreds of extra medical personnel as part of a $100-million emergency response to an epidemic which has claimed more than 700 lives. "If the situation continues to deteriorate, the consequences can be catastrophic in terms of lost lives but also severe socioeconomic disruption and a high risk of spread to other countries," Chan said. She described the outbreak as "by far the largest ever in the nearly four-decade history of this disease". "It is taking place in areas with fluid population movements over porous borders, and it has demonstrated its ability to spread via air travel, contrary to what has been seen in past outbreaks," she told the summit. "Cases are occurring in rural areas which are difficult to access, but also in densely populated capital cities. This meeting must mark a turning point in the outbreak response."